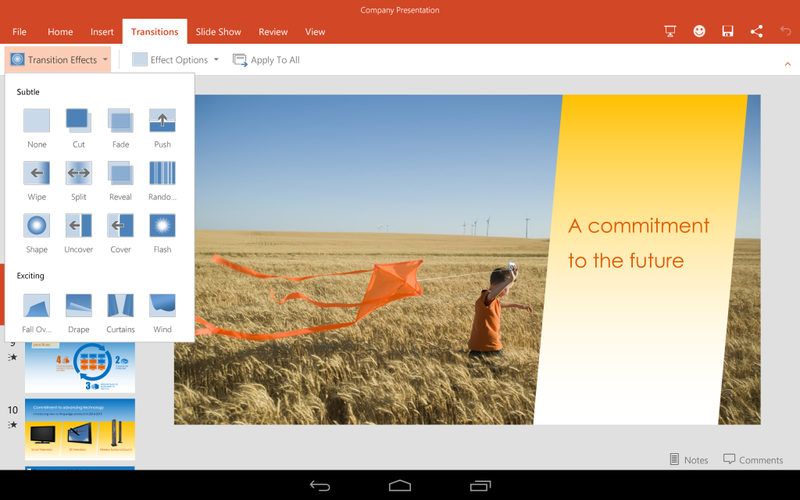 Last March, Microsoft introduced its first tablet-optimized edition of Office exclusively for iPad. The company has now launched a public beta that allows Android 4.4 KitKat and 5.0 Lollipop tablet users to try out its Office apps, but only on tablets using ARM chips. Microsoft's Office also doesn't support the fringes of Android tablets smaller than 7 inches or larger than 10.1 inches, such as Samsung's Note Pro 12.1. Even some tablets that are the "correct" size are excluded for performance reasons, including Samsung's Galaxy Tab 4. That's a $200, 7 inch tablet that a Microsoft representative explained wasn't currently supported because it was too slow, an issue he said Microsoft is "working to resolve." Office for Android also excludes support for all of the ARM tablets that haven't been (or can't be) upgraded to KitKat. According to Google, less than 40 percent of the entire Android installed base accessing its Google Play store is running a version of the OS capable of supporting Microsoft's Office. As of this week, less than 0.1 percent has Android 5.0 Lollipop. Last year, when Microsoft introduced Office for iPad, it supported all models apart from the four year old original iPad; all iPad models from 2011 or later can be upgraded to the latest software supporting Office apps. Microsoft has stated that it won't deliver a touch-optimized version of Office apps for its own Windows products until the launch of Windows 10, which is expected late this year. Intel's Atom is the scaled down, low power version of its desktop x86 chips that have powered the overwhelming majority of desktop PCs since IBM shipped its first personal computer in 1982. Macs have also used Intel x86 chips since Apple switched from PowerPC in 2006. However, after Intel turned down Apple's iPhone business in 2006 and then subsequently failed to win back a role for Atom in the iPad in 2010, its has witnessed an explosion of mobile devices powered by the competing ARM architecture. Despite a variety of efforts to push Atom chips, Intel has made very little progress. Originally codeveloped in a partnership between Acorn and Apple in the late 1980s, mobile ARM chips first saw only limited use in the Newton Message Pad for which they were created. After being selected by Nokia, however, ARM garnered widespread use in simple phones in the 1990s. Steve Jobs sold off Apple's wildly profitable investment in ARM in the late 1990s, reaping a major windfall that helped financed the company's turnaround. In 2001, Apple selected ARM chips to power its then new iPod, benefitting from the vast economies of scale Nokia and other high volume phone makers had created by standardizing on the ARM architecture. Ten years later, Apple had sold hundreds of millions of ARM-based devices, from iPods to iPhones to iPads to Apple TVs and Airport Basestations. In 2010, it launched its first Apple branded ARM chip, the A4, featuring its first efforts to diverge from standard ARM designs manufactured by Samsung. "We have a chip called A4," Jobs announced when showing the original iPad. "which is our most advanced chip we've ever done that powers the iPad. It's got the processor, the graphics, the I/O, the memory controller —everything in this one chip, and it screams." The next year, Apple released iPad 2 powered by A5, which Steve Jobs referred to as the "first dual core tablet to ship in volume," a claim ridiculed by bloggers even though it remained the only tablet to ship in any meaningful volumes throughout the rest of the year. Over the past five years, Apple has launched a series of increasingly sophisticated ARM chips including A7, the world's first 64-bit ARM used in production, and the latest A8X, which rivals the power and sophistication of Intel's notebook x86 CPUs from just a few years ago and beats Nvidia's own efforts to bring desktop class GPUs to mobile devices with the Tegra K1, all while using far less power and dissipating less heat. Over just the past three years, Apple has sold 76 million iPods, 197 million iPads and over 444 million iPhones, all at premium product tiers with Average Selling Prices and profit margins far above its competitors. That has fueled billions in profits Apple has reinvested into, among other things, custom ARM chip designs. Apple now has no need for Intel's mobile Atom chips, which lag ARM designs in both processing power and efficiency. And increasingly, Apple's rapid pace of mobile chip development is causing industry observers to speculate that the company may eventually move to replace Intel's x86 chips used in Macs with internally designed ARM alternatives. Apple still maintains a working relationship with Intel, despite the chipmaker's efforts to get other PC makers to copy Apple's designs, from MacBook Air lookalike "Ultrabooks" to Mac mini clones. At the same time, Intel has been scrambling to hedge its dependence upon Microsoft in PCs ever since its software partner announced plans to port Windows to ARM, a two year project that largely ended in failure after ARM-powered Windows PCs, including Microsoft's own Surface RT, flopped. Intel announced plans to partner with Google and Motorola to deliver Atom-powered smartphone in 2011 that also flopped; the company also partnered with Nokia and then Samsung to develop a non-Android mobile Linux that has also gained very little traction. Even if Apple weren't selling millions more tablets than any other maker, and weren't earning billions in iPad profits while the rest of the market limped between profitless tablet flops, the company's iPad initiatives have decisively split up the WinTel monopoly that once led the PC industry. Apple's partnership with IBM seeks to further accelerate the trend toward mobile devices at the expense of Intel and Microsoft, as well as Google and its Android partners.